Tomas Lindén’s IPP32 exchange was a devilish little puzzle designed by Vesa Timonen. Consisting of only two flat pieces of wood, the goal is to make a single, symmetric shape... Tomas kindly gave me a copy of his exchange puzzle and it has taunted me for the last few months – it is evil! Be warned!! OK, how hard can it be? 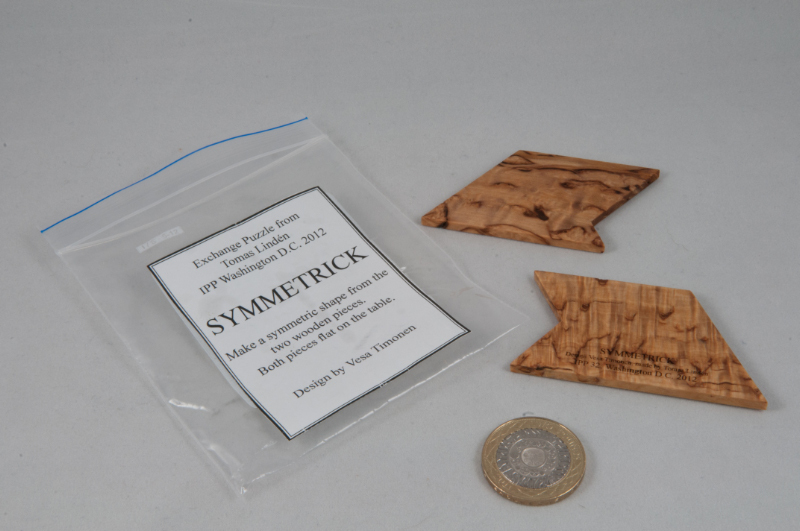 You have two flat pieces that are virtually identical, and you’re told that they both need to be flat on the table and you have to make a symmetric shape. Straight-forward it might be – simple it is not! At one point I resorted to a feeble attempt at using some arithmetic, and measured the edges and played around with various sums and differences, trying to work out which bits needed to be combined or aligned to result in symmetric remainders ... and failed miserably. 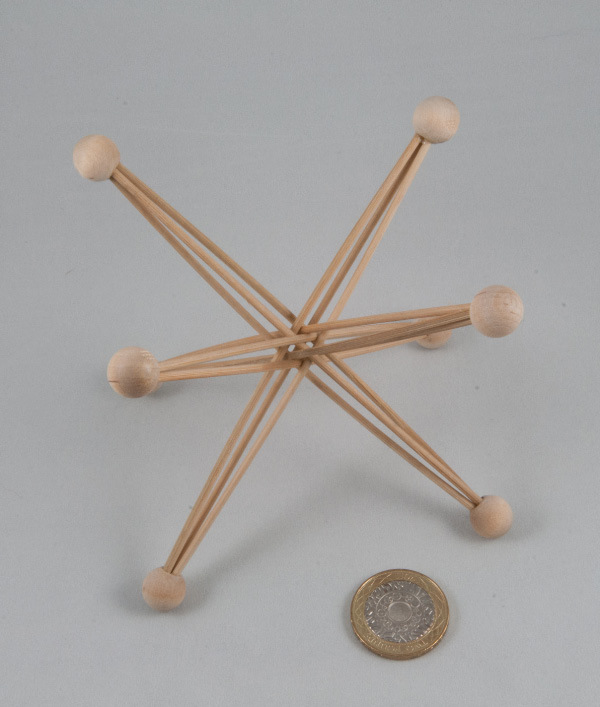 Some helpful soul mentioned that he’d eventually found the solution and then realised that he’d seen that shape a few times before, and not recognised the symmetry in the shape – GREAT! Now I know I’m going to kick myself when I eventually find the solution! 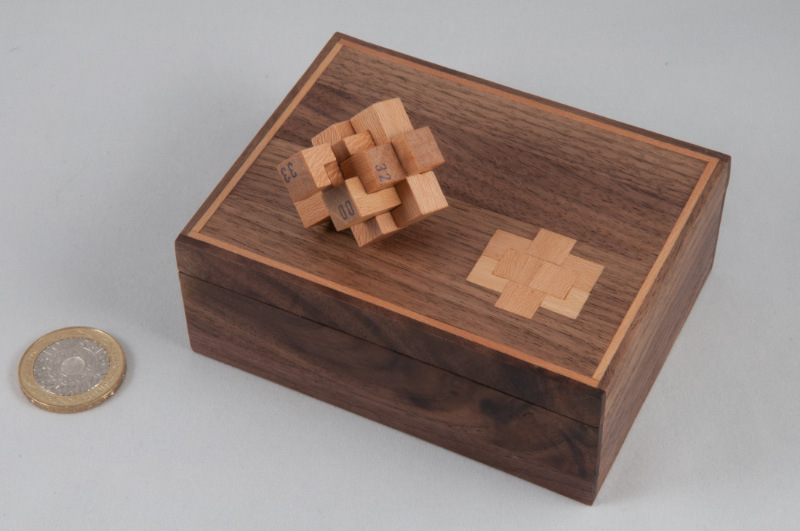 Months later, I found myself out and about having dinner with a bunch of puzzlers in The Hague, and this puzzle’s been doing the rounds and I’m literally the only one left who hasn’t solved it yet, so they give it to me and I try (yet) again! ...and eventually one of them takes pity on me and shows me the answer, and my first reaction is “That’s NOT symmetrical!” – only it IS ... but until you ‘see’ it, you’ll be convinced it isn’t, and merrily move on to the next experiment. 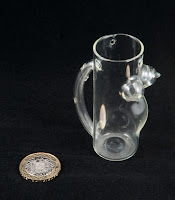 For me, this has to be one of the best little bits of puzzling value for money (even if I HAD paid for it!) 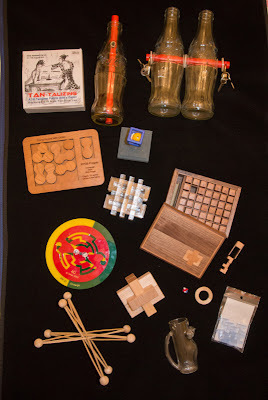 around at the moment ... I’ve heard stories of one or two gifted puzzlers finding the solution in mere seconds, but most folks take a decent amount of time to work it out ... and some of us took forever! 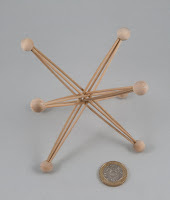 The wooden star functions exactly like its bigger bronze brethren... and still looks great after almost 20 years ... thanks Wil – it looks good next to the rest of the family. 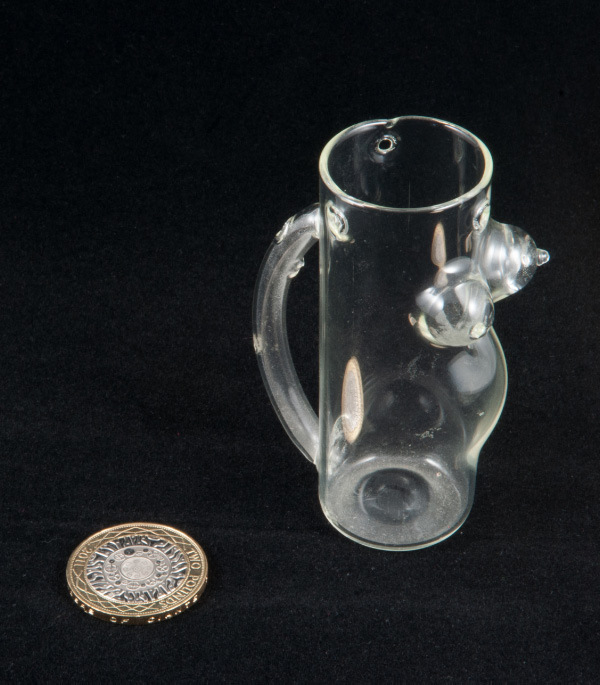 Thanks Wil – it’s really cute, and it’ll always be the first puzzle jug(s) in my collection! Quintet in ‘F’ is number Stewart Coffin’s design #253 ... two hundred and fifty three! And some of them didn’t get numbers! 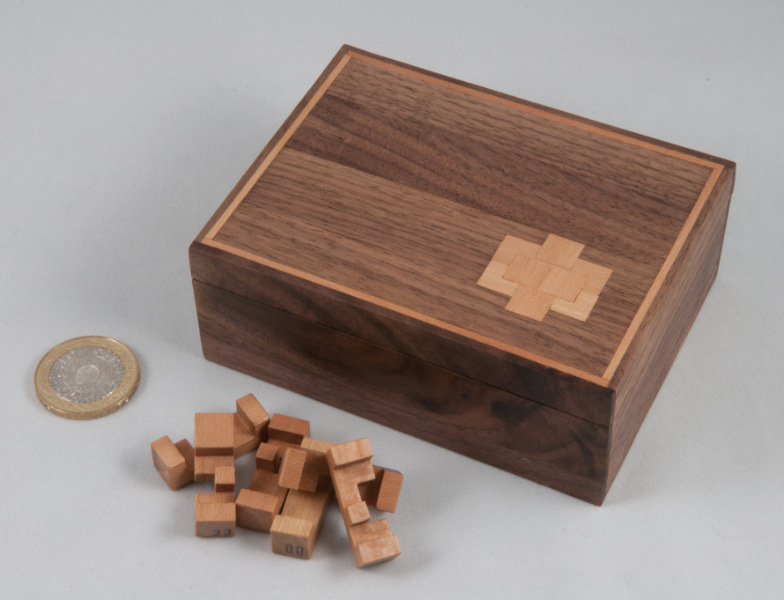 OK, back to the puzzle in hand - Coffin #253 served as Rosemary Howbrigg’s Exchange Puzzle at IPP31 in Berlin and as you might expect from the name it employs five ‘f’-shaped pentominoes in the tray packing puzzle. 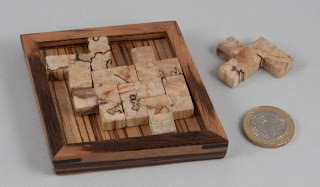 So one day I happened to spot this particular puzzle appear out of the blue – just a single copy available with a zebrawood tray and spalted myrtle pieces and I thought it looked terrific so I snagged it. It arrived less than a week later in perfect condition having made the journey across from Canada in a padded envelope. 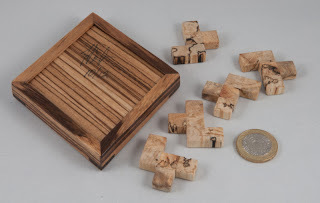 John’s done a super job on this puzzle – the tray has a floating zebrawood base , the corners are finished off with wenge slipfeathers (one of his trademark features) and he’s signed and dated the back of the tray. 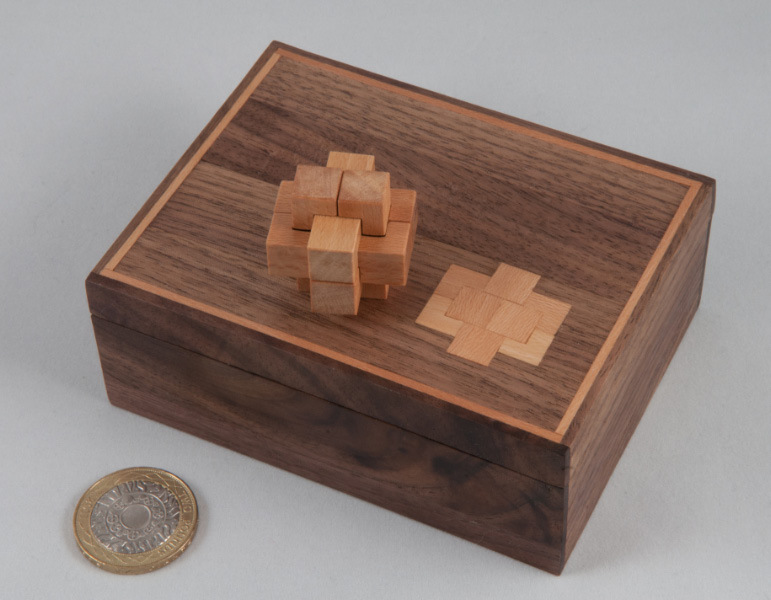 It’s an excellent little puzzle and the combination of an odd number of non-symmetrical pieces being fitted into a perfectly symmetrical tray provides plenty of blind allies to be explored. 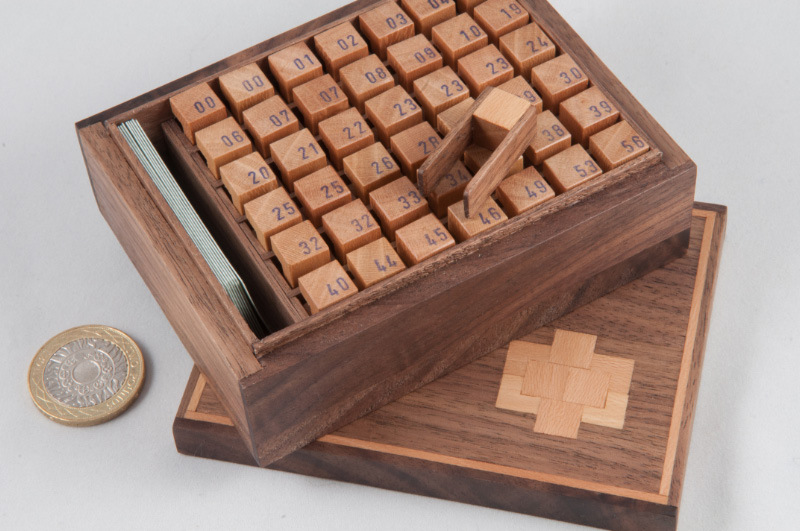 I got fairly lucky and managed to stumble upon a solution quite quickly, but I’ve heard of some pretty mean puzzlers being stumped for quite a while ... but then it IS a Stewart Coffin design, and you wouldn’t expect any less ... would you? 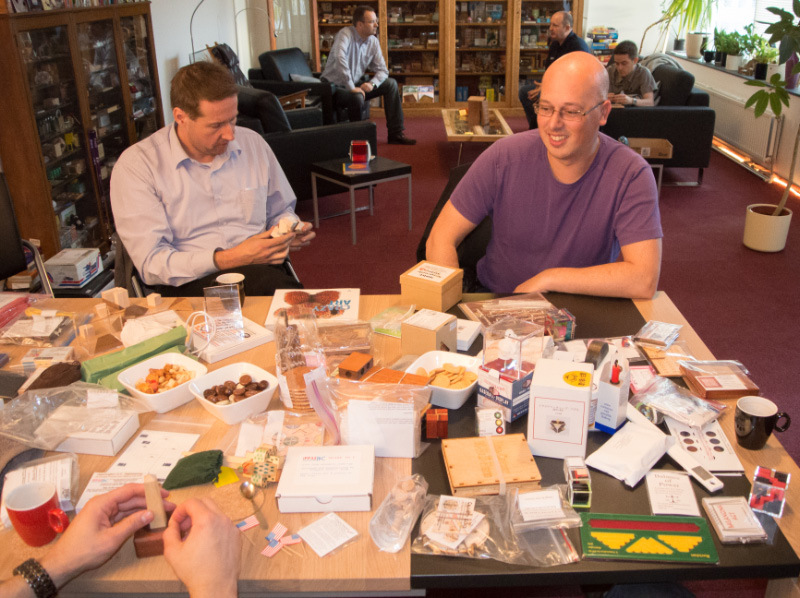 I first spotted Tan-Talizing at the IPP32 Puzzle Exchange as Wil’s assistant. It was exchanged by Yee-Dian Lee and I remember thinking to myself that it looked interesting at the time. (Little did I know!) For some or other reason I didn’t end up picking up a copy at IPP and then when one of Wil Strijbos’ latest emails mentioned that he had them available I was reminded of this puzzle. On our visit to The Hague for DCD 2012 we spent the Saturday afternoon at Rob Hegge’s place and I hauled out his copy of Tan-Talizing and played around with it ... and got nowhere ... then Louis solved it in a few minutes so I decided that I needed to get a copy from Wil the next day, which I duly did. 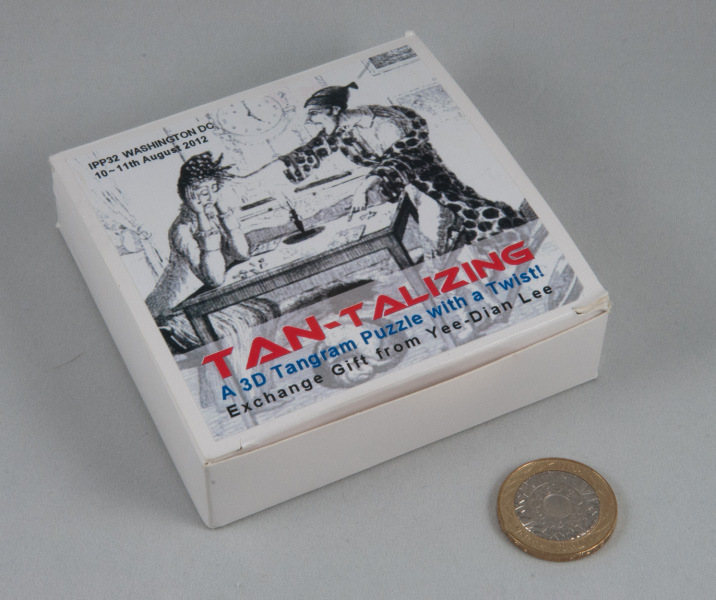 Tan-Talizing is billed on the box as “A 3D Tangram Puzzle with a twist!”. It consists of eight acrylic pieces made up of a combination of tangram pieces across two or three layers. The pieces alternate black and white across the layers and your task is to form a square block four layers high. 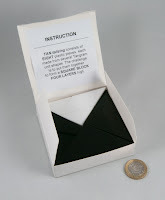 The pieces are laid out as a black one-quarter square with some combination of white pieces stuck to it. 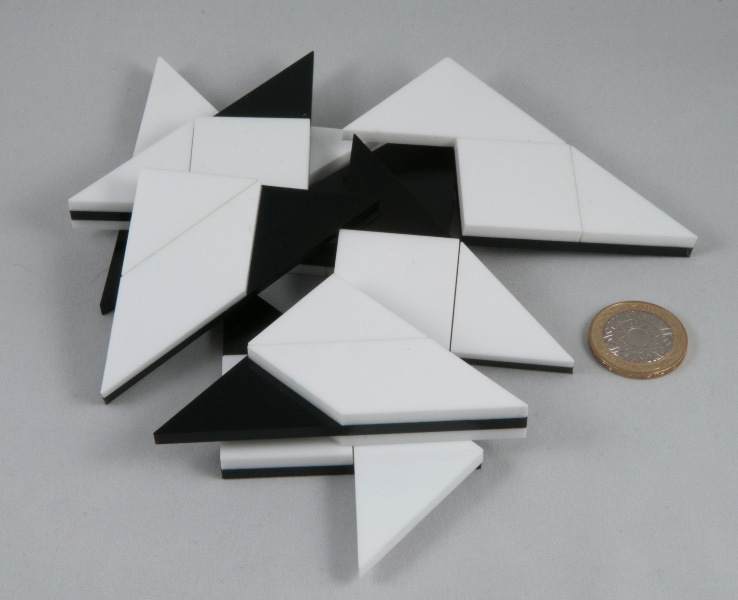 Several of the pieces have white bits overlapping outside the black pieces forcing you to think outside the box a little bit. Hmm, this isn’t quite so simple after all. OK, so experiment with a different configuration on the first half so that you use up different pieces there, leaving different pieces to make up the second half ... it’s worth a try, but I couldn’t make that work... so maybe you need to build it as a whole rather than in a couple of halves – that might make better use of the shapes you have ... then a new brainwave struck: the instructions didn’t say that the colours in the layers have to match! No matter what I did, I always found that I ended up with a couple of unruly pieces that wouldn’t cooperate – even starting with them and trying to get creative with how the pieces might go together – perhaps they weren’t all neatly arranged around the perimeter, perhaps there’s a piece floating in the middle somewhere, or miscoloured? Hopefully you’ll explore as many blind alleys as I did before you find the solution. I’d been playing with it every now and then and not really getting anywhere, then woke up one morning having deduced what the answer had to be, walked through to the study and solved it, just like that. It is a delightful puzzle – my mate Louis described it as a puzzler’s puzzle and I reckon he’s right! 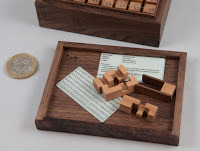 A little over a year ago Jack published some pics of a burr set that he’d made for himself on one of the puzzle forums I follow. The pics looked pretty incredible, and then when I got the chance to see it in person at DCD last year I was totally bowled over. 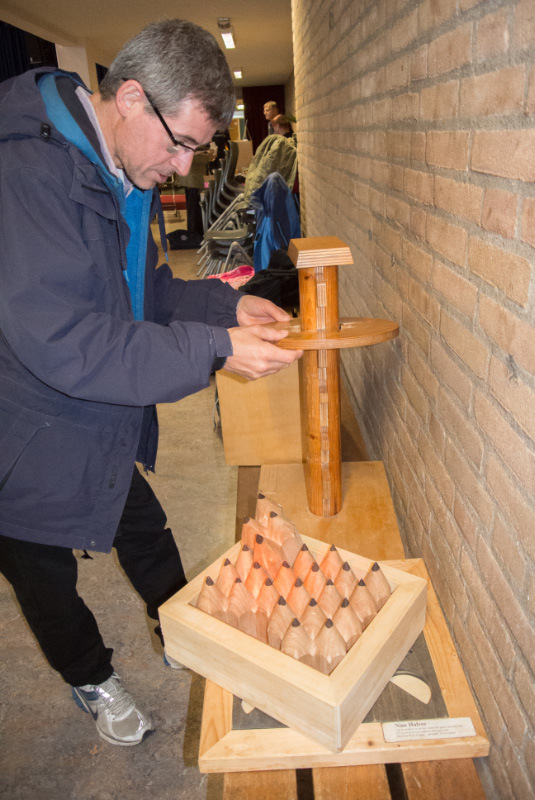 Outside the box was decorated with a stunning inlaid burr shape and a frame and inside there were 42 burr pieces and a set of cards with a heap of level 5 burr definitions laid out on them. Oh, and the one thing I haven’t mentioned yet are the dimensions – the box was about 12*9*4.5 cm. It was a masterpiece in compact design and craftsmanship. 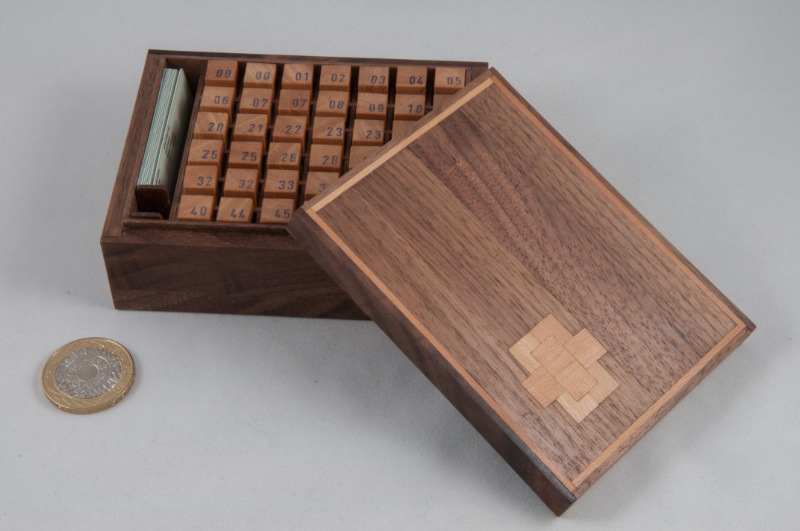 Earlier this year Jack mentioned that he might be making a few more copies of his burr set and I piled in almost immediately and asked if I could be put on a waiting list, if there was such a thing – and happily there was! 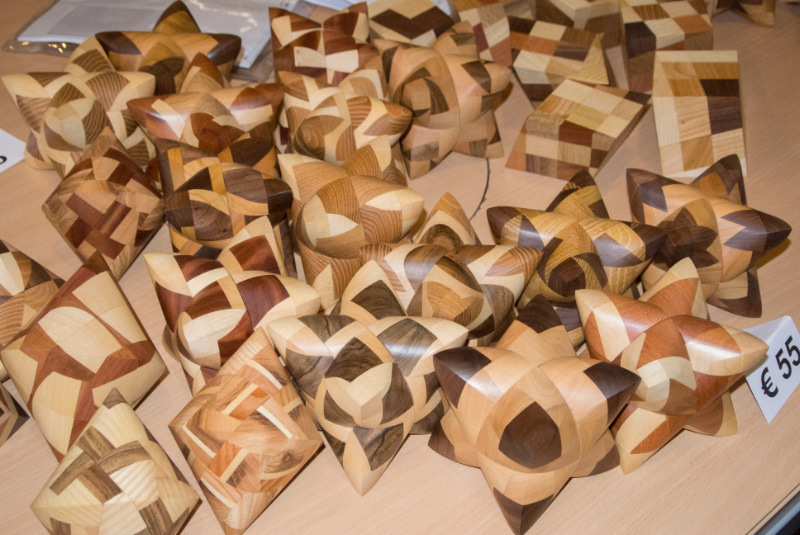 It started with an enormous pile of sticks, which then turned into burr pieces, and then the panels for the boxes appeared and eventually there were pics of the gorgeous inlay work – and he announced that he had eight boxes available and that they’d be ready in time for DCD 2012. The pics should give you an idea of the size of this burr set ... it’s dinky! 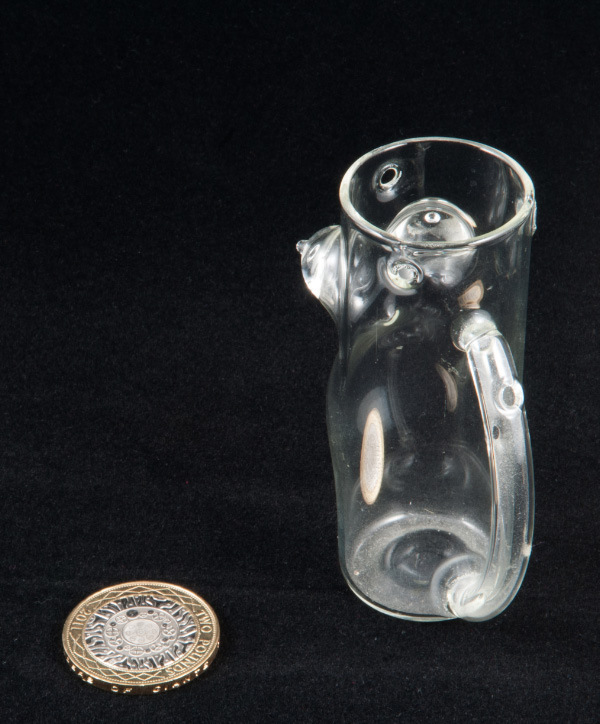 The burr pieces themselves are made from 1cm*1cm stock(!) and have been really accurately cut so they fit together perfectly when assembled. Each piece has been stamped with its identifier on one end and laid out in numerical order in the box and when they’re not being played with, the pieces are all housed in their own little pigeon holes inside the box. In a separate compartment to the left of the burr pieces is a set of neatly laminated (so you won’t smudge them!) cards with 162 unique Level 5 burr problems for puzzlers to get their teeth into ... as well as a number of Level 8 and 9 problems to tax the little grey cells with. 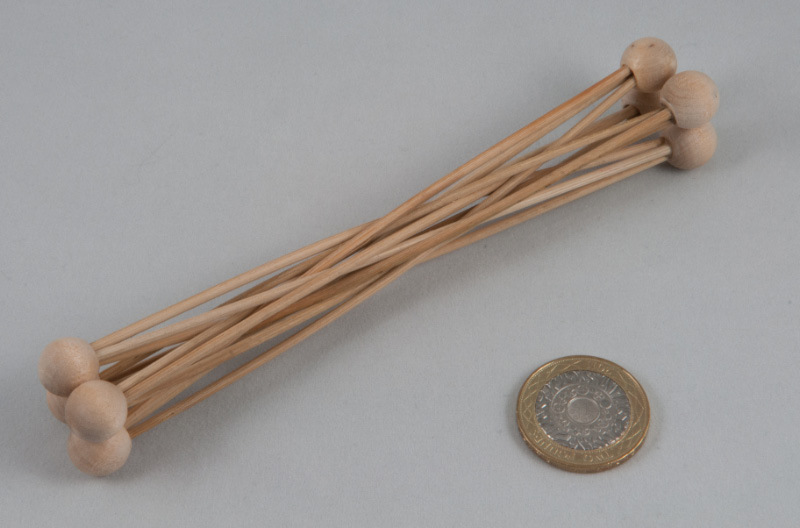 And the piece de resistance – a little pair of wooden tweezers to remove the individual burr pieces from their resting places because you couldn’t fit your fingers between them! Jack’s thought of everything! I’ve had a go at a few of the constructions so far and realised that I still have an awful lot to learn when it comes to assembling burrs ... I’d thought I was doing OK working through my Creative Crafthouse set of lower level burrs – but this one definitely steps it up a gear in terms of difficulty. I’ve managed to do about half of the ones that I’ve tried but I’m determined not to let them beat me so I’ve printed off a list of them so that I can mark up the ones I’ve done and come back to the others at a later stage... 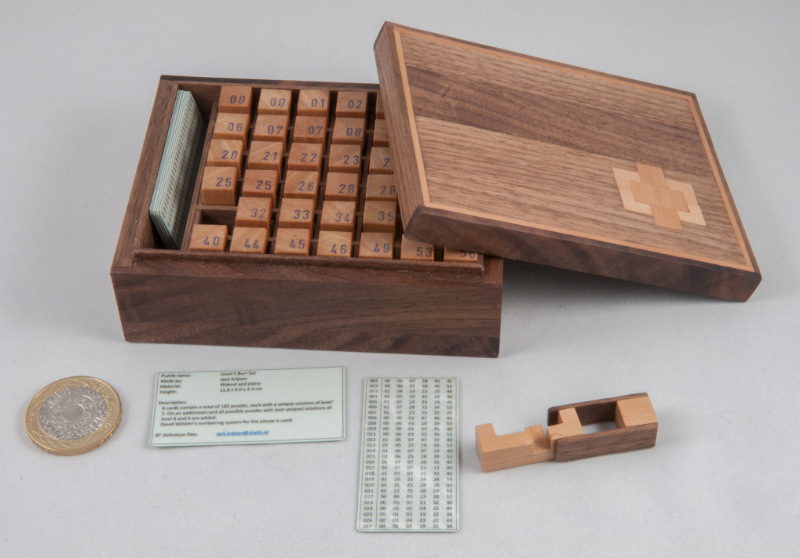 I suspect this little box is going to provide many, many hours of pleasurable puzzling. Thanks Jack – it is beautiful – the first Krijnen-creation in my collection is going to take a lot of beating! ...it turns out that my fellow Midlands Puzzlers had also spotted Jack's handiwork and in the end, four out of the six of us who travelled over to DCD this year came away with one of these sets ... and another of our number who hadn't made it over also managed to snag one, so in the end five out of the eight sets that Jack made ended up in MPP-hands - you can't say we aren't keen and recognise great quality craftsmanship! 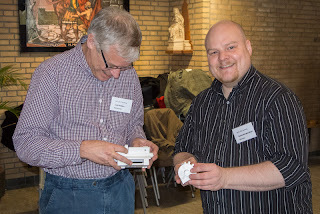 Just over a year ago Nigel and I flew across to The Netherlands to attend the 2011 Dutch Cube Day in Eindhoven. Luckily our fellow MPP-er Louis lives in Eindhoven and he took care of us while we were over there ... afterwards I blogged about it a bit and we talked about it to all and sundry at subsequent MPPs ... and it seems that folks liked what they heard. This time Nigel and I were joined for an early Saturday morning flight from Birmingham by Chris, and Ali and Oli flew across to Amsterdam from Luton. We all met up with Louis who’d caught the train from Eindhoven to Schipol and then the six of us made our way across to The Hague, scene of this year’s DCD. We all managed to check-in when we got there, although there were a couple of fraught minutes until the hotel found Ali’s booking in the name of Mr Alistair instead of the more orthodox use of his surname. When the hotel restaurant opened at 11:30 we all piled in for some lunch as most of us had been at the airport from 4:30 that morning. While we were happily munching away Wil Strijbos pulled up in his red van and hopped out with Christiaan Eggermont. They joined us for a bite to eat after they’d checked in and then headed off to the venue to unpack Wil’s wares for the Sunday. We walked round there after lunch and notionally helped Wil unpack his crates in order to justify our presence. Bernhard Schweitzer had obviously been there for a while already as most of his stuff was already unpacked. It was great to see Bernhard again after a bit more than a year at the previous DCD. 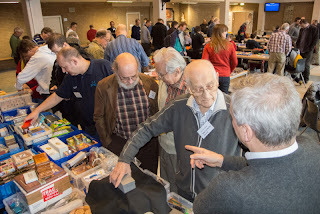 I spotted Joop doing his rounds as one of the organisers and reminding the prospective sellers that they were supposed to be saving their trading for the next day – although I did notice a couple of my mates coming out of there with little parcels or treasure in spite of Joop’s best endeavours. I spent a while trying my hand at Tan-Talizing and failed miserably, only to see Louis solve it in a matter of minutes, take his customary photo of the solved puzzle and then break it up while I tried not to watch... although I have to say that he did a very good job of obscuring anything useful in the process. 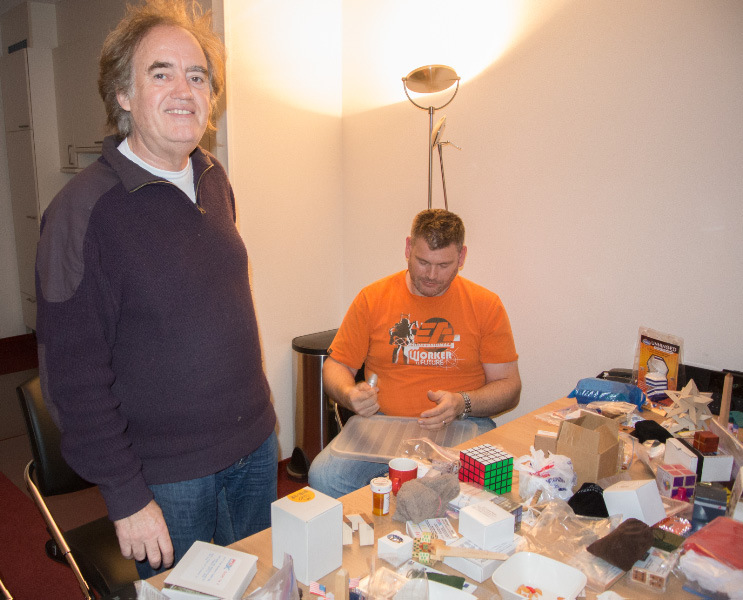 At one point Rob brought out his Roger Shaker and Ali had a pretty good go at it, actually solving it! Locking it up again proved a bit tougher and we had to drag Wil in to try and salvage the position... and even though Wil was seen prancing around the room performing all manner of strange callisthenics, the puzzle remained resolutely open ... sorry Rob. Next morning Louis and I headed back to the venue a little after the opening time and the rest of the gang followed along at a more leisurely pace having sussed out Wil and Bernhard’s tables the previous afternoon. 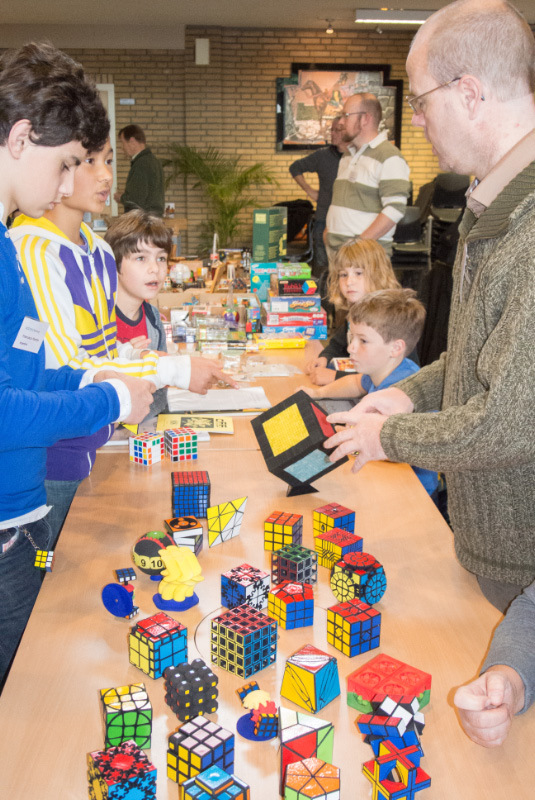 This year DCD was held in Sint Maartenscollege in the school hall, with tables set up for the speed-cubers down one side and puzzle tables taking up pretty much the rest of the hall... and clearly a lot of new folks had arrived between us leaving there on Saturday and getting back on Sunday – there were stacks of new puzzle tables piled high with interesting puzzles, optical illusions and games. 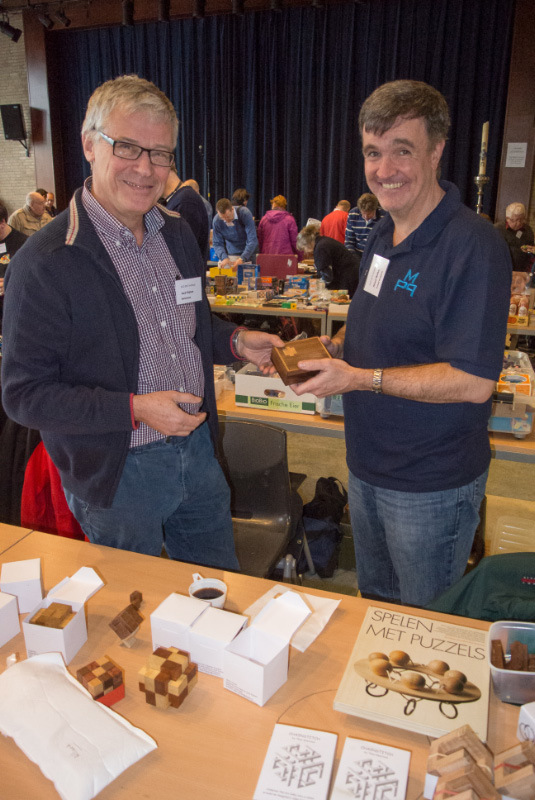 We signed in and each received a micro three-piece cube puzzle courtesy of Richard Gain (the microcubologist) and the organisers – a really nice touch! After lunch we had a couple of lectures – firstly from Frans de Vreugd on his puzzle-hunting trip to Sri Lanka with Peter Hajek. Frans entertained us with some great stories and interesting insights, all illustrated with a terrific set of photos from the trip and a bunch of carved objects all of which had secret compartments hidden inside them. As most of us hadn’t been exposed to any puzzle boxes from Sri Lanka, it made for a really interesting talk. He was followed by Edo Timmermans who gave an inspiring talk on modelling mathematical constructions using simple little magnetic balls – the sort we’ve all played around with at some point... except that his creations were on an EPIC scale – take a look at his YouTube channel and I guarantee that you’ll be thoroughly amazed at what can be done with these simple little ‘toys’ in the right hands. Where else could you get one of Oskar’s designs autographed by the man himself (yip, I did! 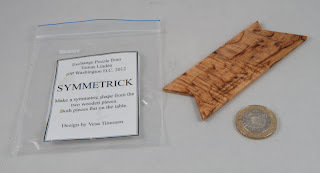 ), or where could you tell Robrecht Louage how much you enjoyed 4 Steps Visible Lock, or chat to Vinco, or talk to Marcel Gillen about his old puzzles and his more recent designs, play with some really exotic twisty puzzles and rake through crate after crate after crate of wonderful goodies from Wil Strijbos. It’s a wonderful opportunity for all of the above, and you get to make some excellent new friends ... all for the princely sum of ten Euros for the day! You cannot beat that for puzzling value for money! 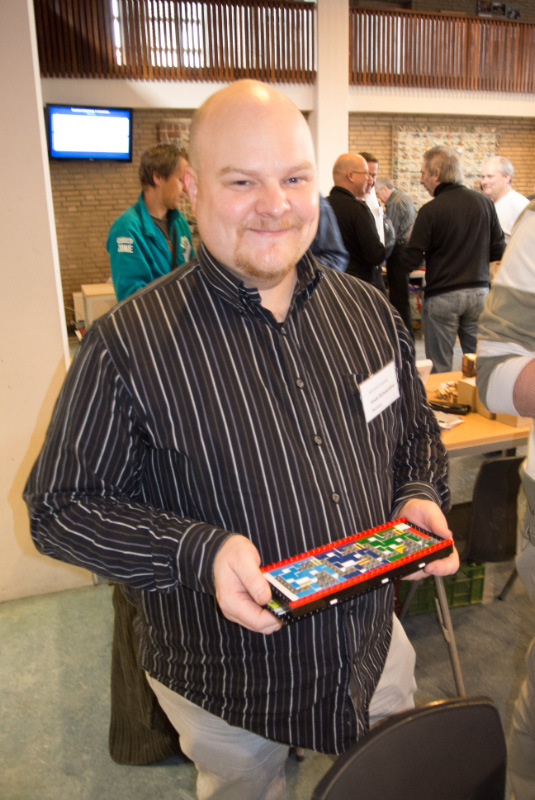 If you haven’t already joined NKC, drop Rik a line and sign up and then join us in Holland next year ... if you love puzzles you won’t regret it! Karakuri duo: humour and torment!